The Republican Party’s immigration and refugee positions defy the Bible. The GOP’s positions on immigration and refugees contradict the teachings of the Good Book the party says it values so much. 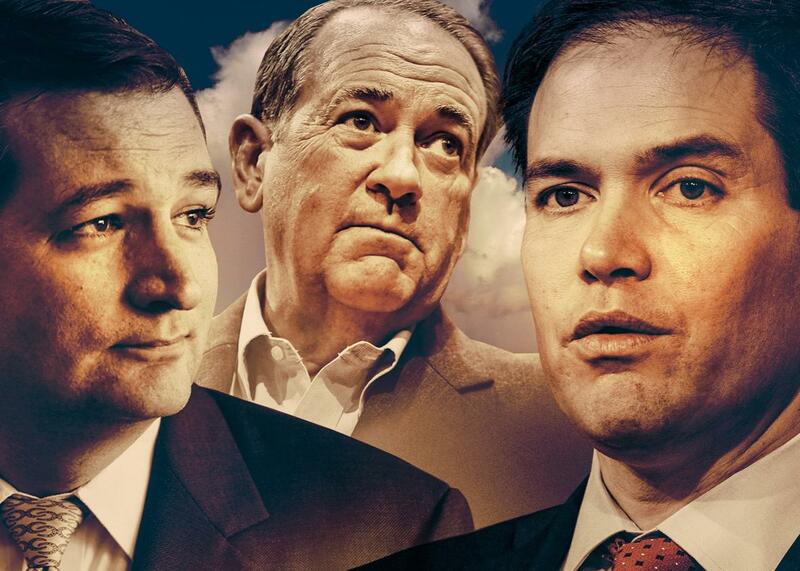 Presidential candidates with biblical leanings: Sen. Ted Cruz, Mike Huckabee, and Sen. Marco Rubio. Nicholas Kristof wrote an op-ed over the weekend that highlighted the irony of recent Republican response to the Syrian refugee crisis. The New York Times columnist made the not-so-subtle observation that Republicans would likely have denied asylum to one of history’s more significant immigrant families: “a carpenter named Joseph, his wife, Mary, and their baby son, Jesus,” who, according to Matthew’s Gospel, were forced to seek refuge in Egypt to escape King Herod’s infanticide. It’s a fair point, but there’s no reason to limit it to the story of Jesus. The truth is the Bible’s authors have an awful lot to say about immigration, forced or otherwise, and their perspective flies directly in the face of the Republican Party’s jingoistic zeal for border-strengthening and turning our backs on refugees. Given the GOP’s enthusiasm for biblically based governance, Republican leaders might want to consider the chasm separating their current immigration policies and the source document upon which they claim to base some of their politics. The story of the ancient Israelites’ exodus from Egypt is perhaps the most obvious biblical story about refugees. Although biblical scholars are divided concerning the veracity of a historical Exodus, folks like Sen. Ted Cruz and Mike Huckabee are most likely in the “it really happened” camp. If so, the striking parallels between this story and the journeys of those fleeing Syria should give them pause. Like the Syrians, Israelites, spurred by the hope for a better future, fled an oppressive regime and endured a lengthy and dangerous journey (Exodus 1:11; 16:3; Deuteronomy 2:14; Joshua 1:6). Regardless of whether this actually happened, the self-conception of Israelites as a refugee people had a profound effect on their writing and culture. Consider the story of Ruth. In this book, Ruth is described as fleeing her homeland of Moab due to famine. She then moves to Judah with her mother-in-law, Naomi, after hearing about the Judeans’ abundance of food (Ruth 1:6). Ruth and Naomi are both widows, a particularly vulnerable class in an ancient world that bestowed women with virtually no socio-political power. Naomi even cautions Ruth against coming with her, urging, “Return home, my daughters. Why would you come with me?” Ruth insists, however, professing openness to whatever her future in Judah may hold: “Where you go I will go, and where you stay I will stay. Your people will be my people and your God my God. Where you die I will die, and there I will be buried” (Ruth 1:16–17). Ruth’s commitment to her only remaining family and optimism about an unknown future should sound familiar to any who reads the testimonials of modern-day immigrants. Upon arriving in Judah, she works, gathering the scraps of food left over from the harvest, a common practice of migrants in her time (Ruth 2:3). When Boaz—the owner of the field—notices her, he, instead of rebuking her for eating from his field, orders his workers to “pull out some stalks for her from the bundles and leave them for her to pick up.” Later in the story, Boaz marries Ruth—a somewhat surprising inclusion given the Bible’s reticence toward exogamy—and their marriage is venerated by its inclusion in Matthew’s genealogy, which names the pair as direct ancestors of both King David and Jesus (Matthew 1:5). The parallels between this story and the present day are obvious. A pair of women, lacking the means to provide for themselves in their famine-stricken homeland, immigrate to a country of relative abundance. In order to eat, they work as agricultural day laborers. Ultimately, they marry and assimilate into a new society where their descendants are remembered among the culture’s chief political and religious leaders. You don’t have to squint hard to see signs of the American Dream peeking through. Yet somehow the political party of “biblical values” continues to endorse not only building a wall to bar the entry of modern-day Ruths and Naomis but, increasingly, a far-fetched scheme to evict those already living in our midst. These plans are typically justified by invocations to protect American citizens and thinly veiled racial anxiety about our country’s changing demographics. The Bible, too, has stories about immigrants moving to occupied territories—potentially disrupting the lives of the regions’ current residents and changing the nations’ direction—except, in these stories, the immigrants are not the villains but the protagonists. The life of Abraham, to whom Jews, Muslims, and Christians all trace their lineage, is one such tale. God tells Abraham, “go from your country … to the land that I will show you” and promises to make his descendants into “a great nation,” concluding: “to your offspring I will give this land.” The author notes that the intended land is inhabited (“at that time the Canaanites were in the land”) but does not even consider that this might be a reason not to go (Genesis 12: 1–2; 6–7). Read from a Canaanite perspective, Abraham is the very definition of an immigrant who travels through a neighboring country’s porous borders, dramatically altering the demographics and future of that region. And, viewed as a Canaanite, there’s no greater “anchor baby” than Abraham’s son, Isaac. The fact that Abraham and Isaac are remembered as biblical heroes says a lot about the Bible’s perspective on immigrants. Biblical exhortations to welcome immigrants—and treat them fairly—feature strongly in the Bible’s legal codes as well. Numbers 9, for example, orders the creation of single statute, “for both the resident alien and the native.” Deuteronomy 24 prohibits “[depriving] a resident alien … of justice.” The prophets address the topic, as well: Jeremiah 22 includes an admonition from the Lord to “do no wrong or violence to the alien,” and Malachi 3 speaks of a messenger from the Lord who will “be swift to bear witness … against those who thrust aside the alien.” This theme continues into the New Testament, too. In the 12th chapter of his letter to the Romans, Paul names “[extending] hospitality to strangers” as one of the marks of a true Christian. Jesus himself instructs his disciples that they will encounter him by welcoming the strangers in their midst (Matthew 25:31–41). This should not come as a shock, given Jesus’ status as a refugee and his tribal identification as an Israelite. Indeed, Leviticus 19 encourages Israelites to remember their own immigration histories when interacting with foreigners, instructing “the alien who resides with you shall be to you as the citizen among you … for you were aliens in the land of Egypt.” As a nation of immigrants, the mandate to remember one’s own immigrant history and to treat “the alien who resides with you … as the citizen among you” ought to hit close to home, particularly for those like Cruz and Sen. Marco Rubio who frequently incorporate their own families’ recent immigration histories as part of their personal stories. I can’t support a literal reading of the Bible or a scriptural basis for government policy. The Bible is a book written thousands of years ago, and thus the Bible, read literally, often promotes policy I find abhorrent—and running counter to the larger biblical message—including support for capital punishment, limitations on the rights of women, and prohibitions against nonheteronormative relationships, to name a few. However, on the topic of immigration, the Bible hits it on the nose. The biblical witness is empathetic to the plight of refugees and immigrants and consistent in its message to the reader: “you shall love the alien as yourself, for you were aliens in the land of Egypt” (Leviticus 19:34). For a party whose leaders claim to stand on the side of the Bible, it might behoove them to brush up on what the Bible actually says about immigrants.